A Systemic Reorientation is akin to an identity crisis. The reorientation is systemic in that our intellectual beliefs inter-relate with our bio-chemistry, our emotional impulses and our intentional actions. Whether voluntarily or involuntarily wrought, significant life transitions (such as getting a job promotion or being laid off, getting married or divorced, buying a house or being forced into foreclosure, having a baby or having our children grow up and move out) are among the circumstances which typically prompt a Systemic Reorientation. Of course people resist pain; what is counter-intuitive is how we also, quite commonly, resist beneficial life-changes. Let us unravel the underlying problem that prevents so many of us from maintaining our hard-earned gains. Whereas goal-setters are warned against the tendency to set goals that merely negate the negative, we should also be warned of our tendency to use Compensatory Losses to negate the positive. The former prevents goal achievement and the latter prevents evolutionary advancement (sustained and growing gains). Because our storied self fiercely resists all modifications, preferring homeostasis (staying the same), it will thwart a Systemic Reorientation, even if the result would bring positive (+1) Efficiency, elevated circumstances, and/or enhanced opportunities. Human-interest news items periodically cover the stories of people who achieve a fortunate windfall and then fail to secure and optimize their newly expanded opportunities. Why is this so common? To winners who use the change to rewrite their self-identification story, deciding to believe that this one-time leg-up is a breakthrough, their new I Can story enables them to pay off debts, establish investments and sustain themselves more comfortably than ever before. Why is it so often the case that a person who has worked diligently to lose considerable weight, and who feels better than he or she has in decades, will give up the beneficial new behaviors for their old habits and add back all the lost weight, and some extra to boot? Weight loss is an example of a positive change that requires a Systemic Reorientation, else self-sabotaging Compensatory Losses prevail. Say we lose considerable weight by depriving ourselves. The weight loss is not sustainable because everyday we feel insatiably hungry and constantly fatigued. Additionally, we may be uncomfortable with the attention we are attracting from others. Under these conditions, we are likely to give up our process and eventually regain our weight, and maybe some more. In this case, homeostasis pulls us back to our comfort foods, familiar pastimes and clique of friends who are similarly indulgent. On the other hand, if we lost our weight by healthy, sustainable life-style adjustments, returning to health-robbing weight would be unthinkably painful, whereas a diet of fresh natural foods and the extra energy that comes from exercising would become pleasurable. The new friends we are making at the gym and health food store are an added delight. Under these conditions, we would be unlikely to gain back our weight. In this case, a Systemic Reorientation establishes a whole new comfort zone. Losing weight and regaining it is like tasting financial freedom and blowing it. Another example follows suit: Someone finally extricates him/herself from an abusive relationship, only to quickly engage in another just as bad, or even worse. All three situations exemplify employing Compensatory Losses in rejection of the dreaded Systemic Reorientation! When life radically alters our personal paradigm, or how we have habitually known ourselves to be, our identities are thrown into crisis. Until we settle in with a freshly-stabilized, newly storied self–perception, we will remain in a state of disorientation. 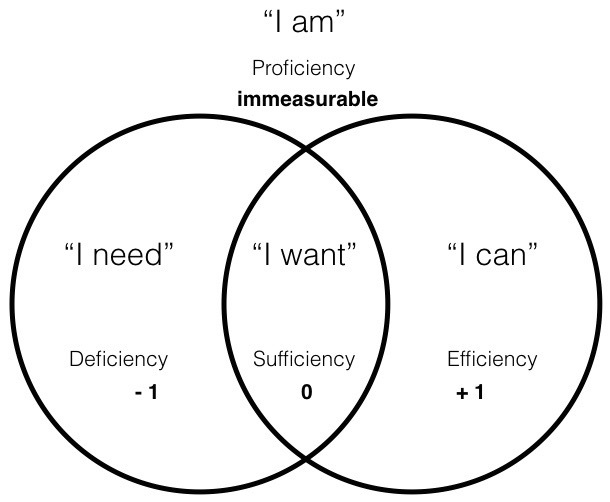 To elevate our operational norm from Sufficiency to Efficiency, we must change what we believe about ourselves in the context of our story of personal identity; otherwise, a powerful yet little-understood force will be working against us. We will encounter the undertow of subconscious sabotage, which is nothing more than the storied-self trying to avoid the disorientation of an identity crisis. Systemic Reorientations are often overruled by the inexorable pull of the infamous comfort zone, where our storied-self feels most secure, and where the pendulum swing comes to rest. 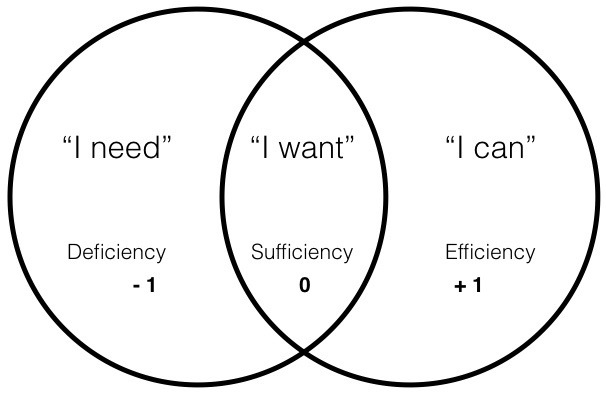 The neutrality (0) of Sufficiency (see below) is our biggest obstacle to higher achievements and purposeful fulfillment. Identity crises do not always happen suddenly or circumstantially. We can just be going along, thinking we know who we are, and before we know it, our persistent paradigm (our self-identity/personal story) has lost its power and efficacy in our lives. At such a time we ask ourselves questions such as these: Who am I? What is my purpose? What am I to do now? We may sense we are being called by something beyond our small-self, who has always been accustomed to rapid-response gratification. We begin to wonder if the person we have long-assumed ourselves to be is really the person who we are meant to be. A soul’s calling may grow intense, compelling us to re-prioritize. At first we may not know what this strange urging is, or how to deal with it. Eventually, we realize that it cannot be quelled by throwing resources at it; we cannot eat it away; we cannot drink it away; we cannot sleep it away; we cannot shop it away; nor can we can exercise it away. We do not know how to be a new self, yet being our old self feels foreign and a bit distasteful. Inspired by what seems irrational, we dissuade ourselves of doubts and keep falling forward, as we do when we fall in love. What has happened to the fear of the unknown which has ruled our decisions up until now? Weirdly, the unknown has become more appealing than the familiar. When our psyche gets out of sync with our adopted/accepted stories, we face an identity crisis. This can be unsettling, for ourselves and our loved ones, whose self-identifications have, themselves, developed to cog in with ours. Mid-life crises are generally stigmatized, as are the therapy sessions that could help us triumph. Keeping the disruption a secret and hoping it will magically resolve itself is a popularly chosen alternative. The ineffectiveness of this option is soon apparent. The so-called middle-age crisis confronts those who have long been living the default version of themselves, and who realize at some point that they have a choice about how to live out the remainder of their time. Yet, just because we know what we can no longer do does not mean that we know what we must now do. Lots of trial and error ensues. Accept the new story which will inevitably emerge to fill the void, playing out whatever root patterns are salvageable within our current situation. Best of all, consciously craft a revolutionary story that perfectly suits our purpose(s) and goals. To develop a narrative wherein our I Wants are transformed into I Cans, we are aided by the purposeful steps of goal-setting, presented in Overcoming the Otherwise. Choosing our own story is an act of empowerment, especially if we mindfully align it with a higher state of being, our I Am. In the context of Quadernity’s Goal-Setting Program, revising our internal story remodels our comfort zone and pulls us through a Systemic Reorientation. Accepting or creating a successful Systemic Reorientation means that ultimately, we become re-balanced within a renewed realistic relationship between our revised story’s directives and our modified circumstances. Our reorientation may happen quickly, as when we fall in love at first sight. Or, it can progress slowly, as happens when we grieve a significant loss. Ultimately, the path to enlightenment transcends, rather than resolves, disorientation. Without anchoring ourselves to any story, we learn to live comfortably in the continuing present, with tolerance for the unknown. While we are confronted with the phase-changes of life, we remain unfazed. And while conditions and circumstances appear to change ceaselessly, we acknowledge that these appearances rise and fall within the changeless Eternal Comprehensive Perfection.